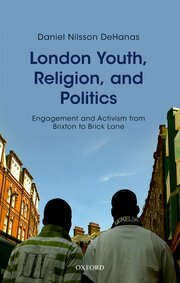 In London Youth, Religion and Politics: Engagement and Activism from Brixton to Brick Lane, Daniel Nilsson DeHanas offers an illuminating comparison of the lives of Christian and Muslim young people in Brixton, South London, and in the East London borough of Tower Hamlets. With the book focusing particularly on questions of civic engagement and political participation, Sadek Hamid finds this a valuable, empirically rich and theoretically informed text that will increase understanding of how different forms of Christianity and Islam influence the daily lives of young people in London and challenge lazy media stereotypes that often frame perspectives on the social integration of ethnic minority youth. London Youth, Religion and Politics: Engagement and Activism from Brixton to Brick Lane. Daniel Nilsson DeHanas. Oxford University Press. 2016. Daniel Nilsson DeHanas begins his book, London Youth, Religion and Politics: Engagement and Activism from Brixton to Brick Lane, by quoting a question from another: ‘Can Europe be the same with different people in it?’ This is a reference to the subtitle of the bestselling polemic Reflections on the Revolution in Europe, written by the journalist Christopher Caldwell, and serves as an entry point into the current debates about immigration, secularism, national identity and the relationship between Islam and the West. It’s difficult to read a daily newspaper that doesn’t contain a story about Islam, integration, radicalisation, women or sharia: European debates about religion in the public sphere appear to have an obsession with Muslim religio-cultural practices or acts of terrorism committed in the name of Islam. These essentialised depictions have become normalised across the media, are common currency among politicians and help to fuel anti-Muslim sentiment across the continent. In London Youth, Religion and Politics, DeHanas not only engages the sensitive discourse around the ‘Muslim Question’ in Britain, but also provides an illuminating comparative between the lives of Christian and Muslim young people in the UK’s largest urban space. Based upon extensive fieldwork on the streets of Brixton, South London, and in the East London borough of Tower Hamlets, the book contrasts the lived experiences of young Bangladeshi Muslims from Islamic revivalist traditions and those from Jamaican Pentecostal and traditional churches. This text thereby provides an insight into the relevance of religion among young people from different faiths, whose concerns overlap around issues of race, religion and identity and intersect around challenging social problems that are common within inner cities. The author points out that questions surrounding the disparate levels of social engagement among these two groups are linked with the fact that many black and South Asian communities are the most economically deprived in Britain, with the lowest levels of educational achievement. It is within this context that religion is mobilised by some young people in these communities as a means of achieving spiritual renewal, social mobility and developing civic responsibility. This is an important point considering lazy media stereotypes that frame the social integration of ethnic minority youth in terms of well-worn tropes that warn of the ‘problem’ of young black men and similar two-dimensional representations of radicalised/criminal young Muslim males, who are claimed by some to be prone to religiously-inspired violence and to embodying toxic forms of masculinity. In interpreting his findings, DeHanas offers a number of analytical frameworks, one of which is his conceptualisation of civic engagement. He posits a three-dimensional model: civic identification; political literacy; and political participation. For most respondents that were interviewed, British citizenship was defined in common sense phrases, such as ‘I was born here’, but were more nuanced in how they self-identified. Black youth identities were highly diverse and layered according to personal choices informed by life experiences, gender, geography, faith and family history. The Bengali Muslim young people also adopted a variety of identity options that were hyphenated and hybrid. Both of the sample groups questioned reported relatively high levels of political knowledge that demonstrate an awareness of the basics of British democratic processes, which may have reflected their age, education, proximity to Westminster or possibly social class. Interestingly, it was in the third aspect – political participation – that significant differences between the two cohorts emerged, in particular on the basis of religiosity. The levels of participation among Bengali young people living in Tower Hamlets were consistently higher than the youth of Jamaican heritage. The religious Bangladeshi youth in this study appeared to more politically active. The author suggests that this is in part due to the politics of identity, arguing that Black identity politics peaked in the 1970s and 1980s in Brixton, but seems to have faded in recent times. For religious second- and third-generation Jamaican young people who attend the churches in Brixton, the mega-church Ruach Ministries is among the most popular but is not known for encouraging political action. Churches in the locality generally focus more on personal transformation and display a lack of confidence in British politics to facilitate community change. This ambivalence was illustrated in the case of a march organised in 2009 by the Adventist Church to demand political action on gun and knife crimes, which was somewhat neutralised when the main speaker expressed doubt in mainstream politics. In contrast, transnational consciousness, affinity to fellow Muslims in Iraq and Afghanistan on the receiving end of British foreign policy and subsequent politicisation have grown steadily among Muslim youth in Tower Hamlets since the 1990s. The repercussions of the UK government’s ‘Prevent’ counter-terrorism policy have further heightened political consciousness and activism. A third factor is the greater political opportunities for participation and youth mobilisation compared to Brixton through established networks in the East End, such as the revivalist Islamic Forum Europe, based at the East London Mosque. This manifested in regular instances of religiously-inspired activism, from public events that raised money for the homeless to activities on university campuses to campaigns to tackle economic injustice and to encourage the joining of political parties. In summing up, DeHanas has provided a valuable, empirically rich text that is theoretically informed and contributes to increasing our understanding of diversity, integration and to what degree different forms of Christianity and Islam influence the daily lives of young people in a global city. This comparative approach is a useful corrective to the constant exceptionalisation of British Muslim young people and offers a nuanced enquiry into types of British African-Caribbean youth religiosity that are often poorly understood and how these relate to concerns about civic integration and political participation. Editor's note: This review was originally published in The London School of Economics Review of Books, and has been reposted with permission. It is available under Creative Commons and the original page can be found here. Like what you read? Subscribe to the SFRB's free daily email notice so you can be up-to-date on our latest articles. Scroll up this page to the sign-up field on your right.